Although it may seem from the recent housing headlines that the decrease in housing prices is accelerating, my Excel graph of the S&P/Case-Shiller Home Price Index shows a continuation of the same trend lines established in 2007. 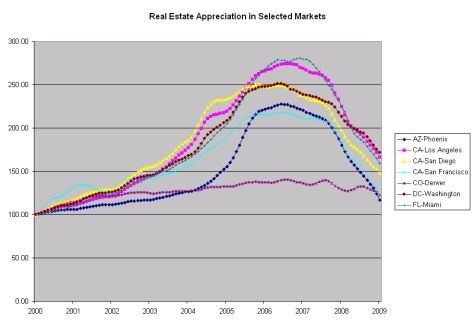 In a previous post I included a chart Robert Shiller made that predicts that the housing market will bottom out in 2011 at a price level somewhat below the 2000 level based on previous downturns in real estate. His prediction continues to look likes its on track. A recent Bloomberg headline, California Home Prices Decline 41 Percent on Foreclosures, leads me to believe that some selected areas such as California will go much lower than the 2000 price levels due to the large amount of foreclosure activity in their real estate sales.